The Sahara issue continues to poison relations between Algeria and Morocco, to the extent that an Algerian official has physically assaulted a Moroccan diplomat during a meeting of a UN body held Thursday (May 18) in St. Lucia. 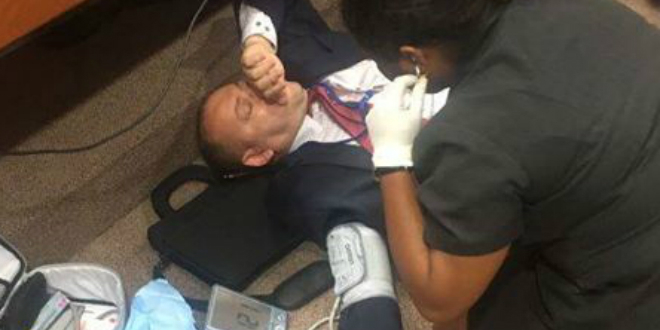 Soufiane Mimouni, Director General of the Algerian Ministry of Foreign Affairs, assaulted the Deputy Chief of Morocco’s Mission in Saint Lucia who was hospitalized for medical treatment. The incident dismayed the members of the UN Special Committee of 24 that was convening in this Caribbean island. Reacting to this unprecedented aggression in a UN meeting, Moroccan Foreign Minister Nasser Bourita expressed indignation at the Algerian official’s behavior. “The assault by a senior official, third in the hierarchical order of the Algerian Foreign Ministry, transgresses all diplomatic customs,” said Nasser Bourita, describing the incident as “very serious”. He pointed out that going as far as attacking physically a diplomat at an official meeting is certainly unique in the annals of diplomacy. The Moroccan Foreign Minister expressed amazement that the physical assault was made by an Algerian official, at a time Algeria constantly claims it plays a mere observer role in the Sahara issue. Actually, Algerian officials’ nervousness has been growing since Morocco reintegrated last January the African Union (AU), where a majority of member states no longer recognize the Polisario. And the feverishness of Algerian diplomacy has redoubled since the end of April when the UN Security Council adopted resolution 2351. This resolution enshrines negotiation as the only way to achieve a political and mutually acceptable solution to the Western Sahara conflict and definitively excludes, like the other resolutions adopted since 2001, any reference to the referendum, so fiercely defended by Algeria and the Polisario separatist movement.